In areas unequipped with collective gravitational sewage system, because of unfavourable land form, geological composition of the land (watercourses) or dispersed buildings, pressure sewage system is constructed, which consists of a watertight tank, a pump, a control system and pressure fixtures. 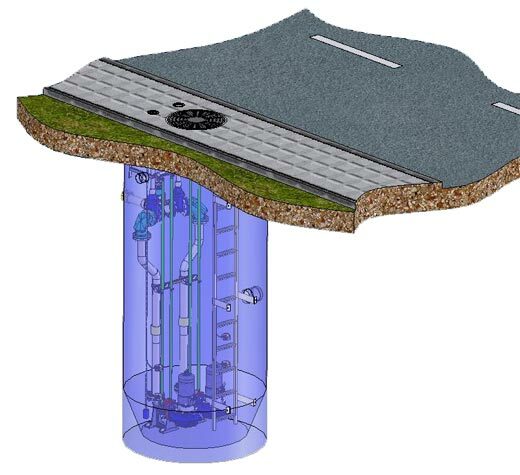 A pressure sewage system is comprised of individual sewage pumps, located on the sites of respective properties and connected to one sewage collector that discharges sewage to a sewage treatment plant. city and commune sewage systems. that are remote from sewage collectors, to pump household sewage, drainage and rain water, as well as industrial sewage to collectors or directly to sewage treatment plants. 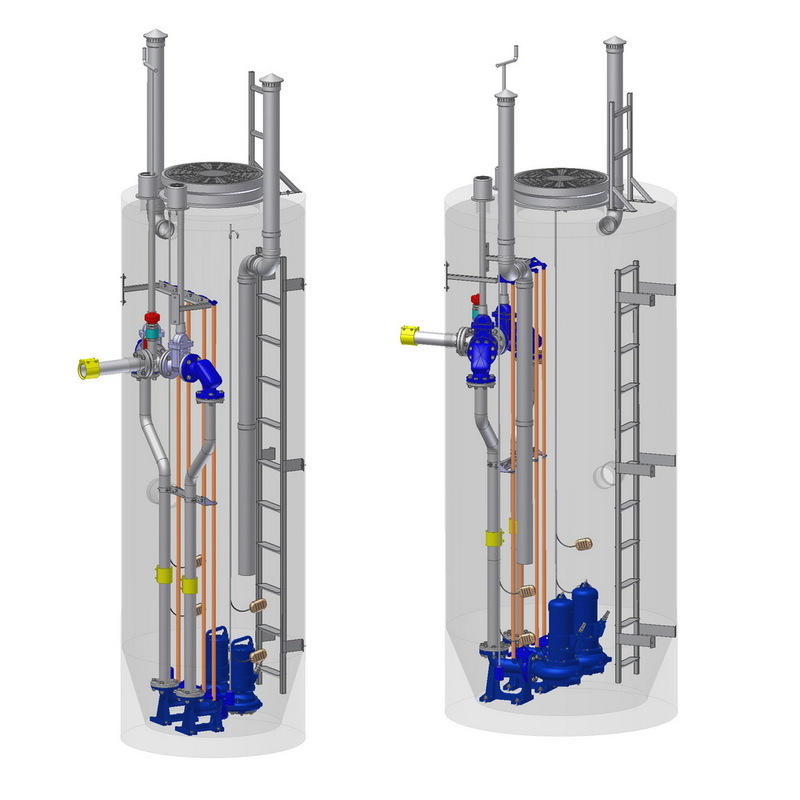 In sewage systems, these pumping stations can be used as intermediate, area and central. number of pumps in pumping station "b"
Material composition of tank "d"
List of diameters and heights of tanks in pumping stations "e1e2e3e4"
diameter of pressure pipeline connection "k"
Sewage pumping stations made by Hydro-Vacuum S.A. are complete, fully automated machines that do not require constant control. 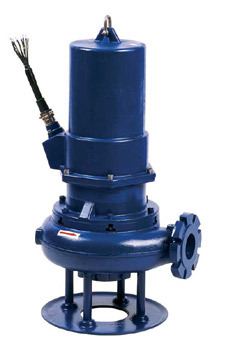 Pumps fitted with a grinding system allow to transmit sewage in conduits with smaller diameters (min. DN 32). 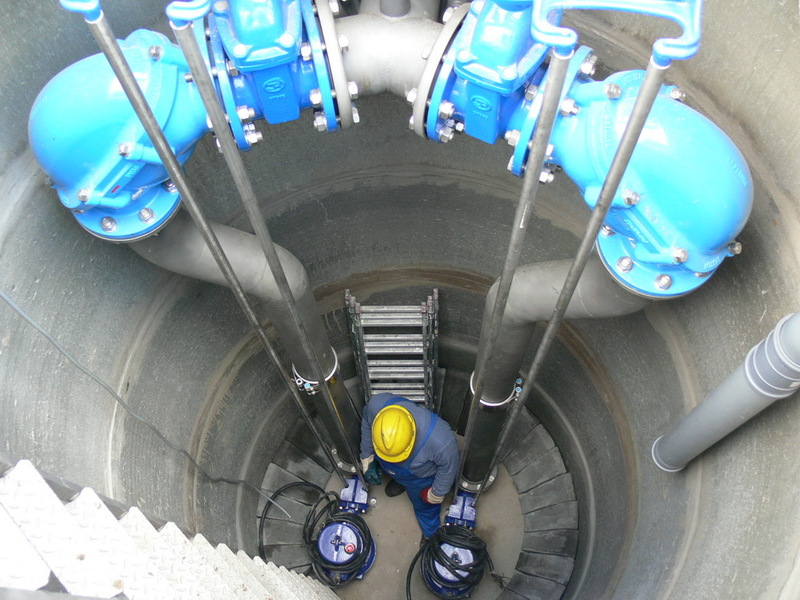 Free-flow (vortex) pumps lower the risk of pump clogging. P umps with a channel impeller are used mainly for pumping rainwater, industrial sewage that does not contain long, fibrous elements. 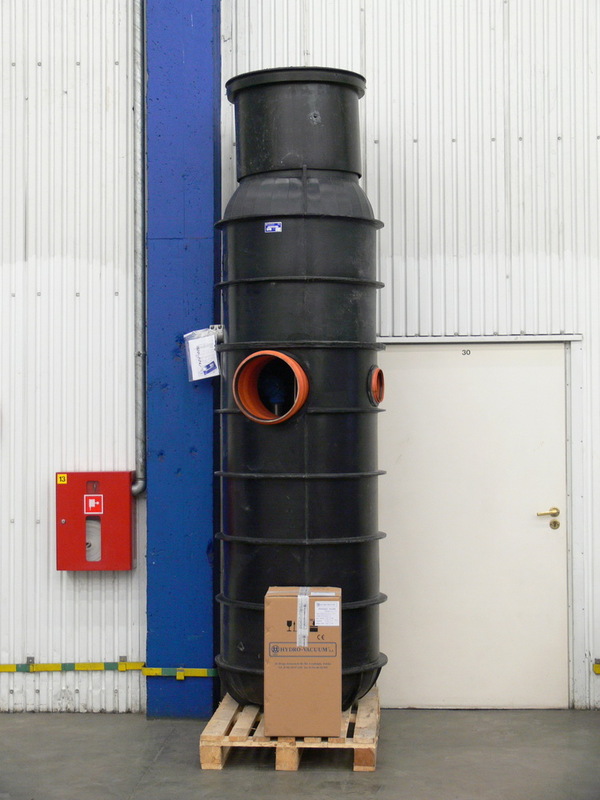 Depending on the requirements of the designer, the above tanks are made in diameter range from 600 to 2500 mm and heights up to 6000 mm. 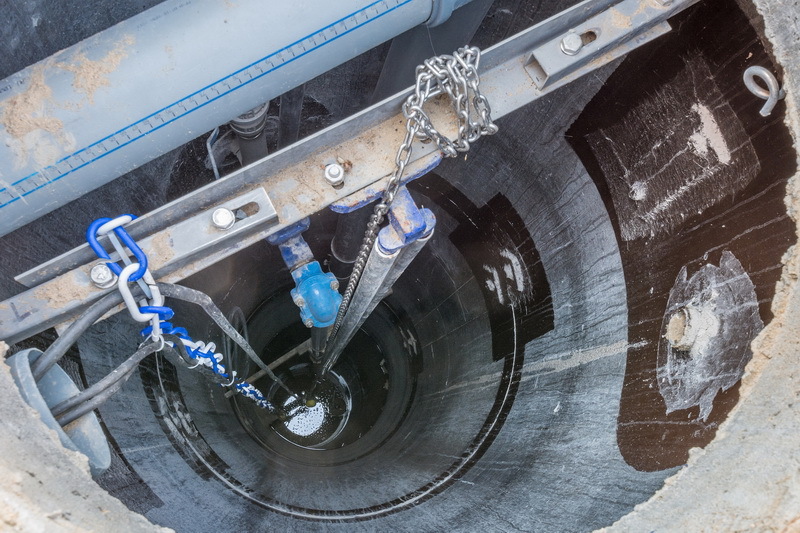 In the upper part of the tank is installed a manhole that enables to descend into the pumping station or take out the pumps and hydraulic equipment. 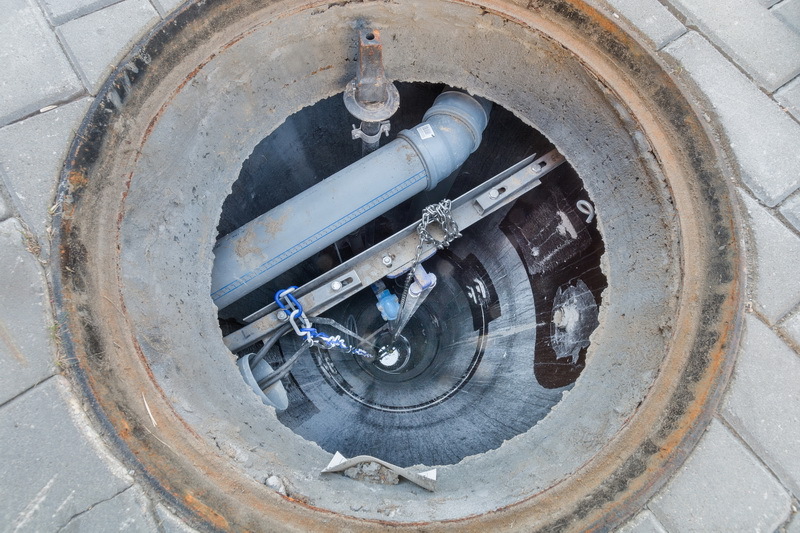 Manhole types are selected depending on the place where the pumping station is located: inside or outside a thoroughfare. Operation of the pumps is controlled with safety and control devices UZS.4, UZS.7, UZS.8. 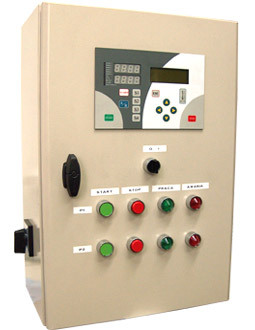 Float level signalling equipment or hydrostatic and ultrasound level control systems are used. 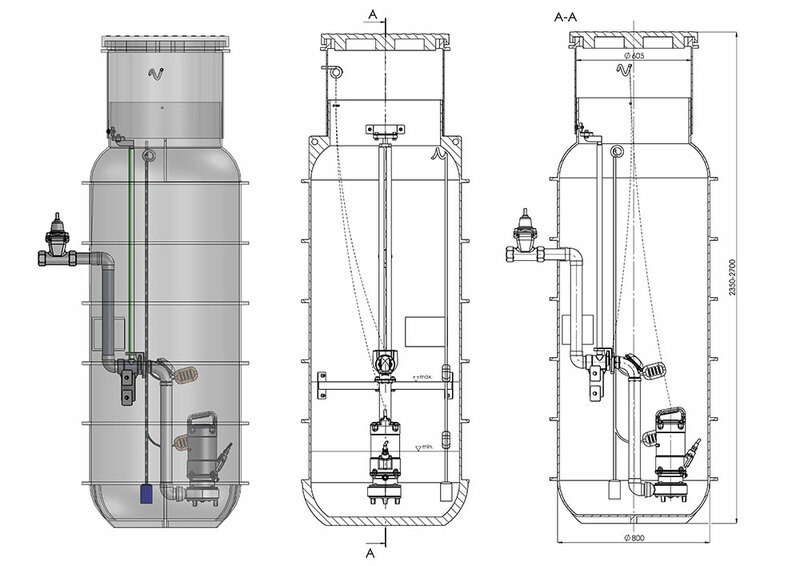 External variants of UZS safety and control systems are intended for operation in moderate climate conditions in ambient temperature of -30°C to +40°C, at relative air humidity up to 80% at 20°C, in an environment free of water and dust, gasses and explosive, flammable or chemically active vapours. The altitude of the place of installation should not exceed 1000 m above sea level. UZS safety and control devices are made from electronic and electric automatics elements, connectors and control equipment. UZS safety and control devices can be hung on building walls or immediately on pumping station tanks or in their vicinity. In the bottom part of the casing are located sealing glands, with power, receiving and control cables inside. All devices have acoustic and optical signalling of alarm conditions in the standard variant. GSM monitoring systems included in our offer are intended for monitoring the work of sewage pumping stations operating within the range of GSM networks. The above elements are made of acid-proof steel / PVC ventilation /.